“Practice makes perfect” is a pretty common concept…and it is true. That said, I am thinking about what we learn from experience. Experience IS a good teacher! Since this blog is focused on quilting, I want to talk about some of my experience over the 3 years, or so, that I have been at this craft. More specifically, I want to talk about prepping your fabric…. I hope some experienced quilters will join in on this topic with comments about what they do. Sharing can only help each other, and especially help those starting out. That is, unless they tend to be like me and have to learn for themselves! It is not my most proud revelation, but true. Today’s topic is an example. I am following along with Meghan and the Sienna Burst QAL. “This week is all about getting ourselves set up for success to start tackling the blocks. Starch, iron, cut; mix and match fabrics and learn all about HRT.” What I want to drill down on even more in this post is about the STARCH. Side note: I previously posted on “Quilter’s Moonshine”. Meghan offers up her own version, that I have heard works very well too! You need starch…lots of it!!!! Preparation…Meghan says to Starch, Iron, Cut. I decided I was going to do every step this time, as directed. In my EXPERIENCE, I have seen how fabric can shrink up when being pressed with either water or starch. You might think this only happens with lower-end fabrics. I hope the pictures I am including below will help you see that it happens…and not only with cheaper fabrics! This is my first piece of fabric. It is Kona cotton, an acceptable quilting fabric from Robert Kaufman. You will note that I have folded it flat and removed the selvedge. (Another post for selvedges, one day…I love them!) On the cutting mat, you can see where the edges fall. Right side at the 1″ mark, left side at 22″. Zoomed in a little to show the 22″ marking. The other side is at the 1″ marking. Now I have pressed one time with starch. Do you notice those bumps? Those are created from the fabric shrinking in some places and not others. Probably not enough saturation with the starch! You can see the bumps almost disappear when the starch is sprayed on them! This process took THREE times starching and pressing. Prepping about 1.25 yards of fabric used about 12 ounces of starch. Yep! that is why “Frugal Frieda” here likes the homemade version! Now, I hope the pictures below will tell you, in plain sight, why this preparation is important! Remember above, the fabric was laid out on the mat starting at the 1″ mark and it measured to the 22″ mark. The following pictures are after the starching process. We have lost 1/2″ in width. Notice the difference in the bottom that WAS straight. Notice the variation in width and length across the piece of fabric that WAS straight before starching and pressing. These are the trimmings left after cutting the fabric to be straight, squared up, and ready to cut. So why is this important? What EXPERIENCE has proven to me is that if this process is not done first, your blocks will likely be really out of shape and proportion when you starch and press them AFTER you have made them! This results in seams and blocks that don’t match up and much frustration. Also, if your fabric is preshrunk and crisp before you sew, you will have a much better chance at perfect points! If you want to learn by doing, go for it! That will work too, but once you have progressed to the point of buying quality fabrics, working more challenging patterns, and expecting a well-finished piece, you will understand..JUST DO IT! Prep your fabics! From one who learned by doing, had some good outcomes, and some very frustrating finishes! It seems like Sunday is a good day for sharing! My main focus right now is Foundation Paper Piecing, and I just read a post from Amy, @duringquiettime, who is a huge FPPer! She shared some great tips for the process on her blog here. Number 3 is my biggest pitfall…trying to use up such little scraps! And, if you missed it, I posted on Friday about a DIY lightbox. Amy also shared a discount for purchasing a lightbox on her blog, linked above. Thanks, Amy, for all your inspiration, patterns, and beautiful work! Well, maybe it isn’t THAT good, but I got a great idea today! I have gone back to doing some FPP, Foundation Paper Piecing, lately. You have heard the phrase, “use it or lose it!”, well, it feels like I lost it! I am sticking with it, though, because I really like some of the designs and they will be perfect for some of my upcoming projects. All that said, I decided I needed a light box for this process. You read about it being helpful and so I thought I would give that a go. Now, if you read between the lines in these blog posts, you can learn a little more about me. (Read between the lines here.) This morning, as I was planning to go searching for said light box, I had a message from my creative spirit guide, Shambala. (Did you catch the clue about me?) Anyway, standing in the shower…inspiration comes in the strangest places, but who cares?…I thought I could make my own light box very easily and it would be always handy, not take any extra space, and cost nothing! How can it get better than that? First thing I did was to go online and see what Google could tell me about DIY light boxes. I saw some ideas, but I did not see the idea I had! Happy dance! I know you can’t wait to see this! Here it is…my tablet, turned light box! In Photoshop, I created a square measuring 14″ x 14″ and filled it with white. It could be any size, actually. It could also be done in other programs OR just take a picture of a piece of white paper. Save it as a .jpeg and call is something you will remember. Mine is called Light Box…creative, eh? The catch to make this work is to turn the display brightness all the way up! You can use your computer screen, your phone (if small works! ), or your tablet, which seemed best to me, since it is flat and bigger. Open your Light Box jpeg and fill your screen with it. Voila! Note that the darker your fabric, the more difficult to see, but on this medium blue you can still see that the fabric fits. Again, this image is darker than reality. No, it does not work for dark fabrics. I don’t think most anything would work for this. So, dare I say that I feel greatful to Shambala? And, if you don’t believe in spirit guides, you can just give me credit for this one! It took all of about 5 minutes, max…and I think it works pretty well…if I do say so myself! Oh, and don’t forget to turn your brightness back down to the level you like after using your new light box. That will save on your battery use…and your eyes! I plan to post more on FPP soon, so keep an eye out for that, if you are interested. Oh my! How does one recap an event like QuiltCon? I am overwhelmingly inspired, happy to have made new friends, and not sure where to start next! I was ready and raring to go! I attended with my friend and “sew mate” – Jude, @judemadeit – a trip we had been planning for a long time. As we walked in the first day, we were shocked to see our Charity Quilt hanging proudly, first one in line! Mountains of Hope is destined to live in a home built by Habitat for Humanity. Our group, an independent members group we dubbed the SewIMQs, felt that a quilt needs a home and selected Habitat for that reason. The other members were Jude, @judemadeit; Lorrie, @langdon813; and Adrean, @quiltfabulous…you can find them on InstaGram with the handles shown. It was such a pleasure to work with these gals that we didn’t even know before deciding to seek members for our little clan, and to create a work of art. Thanks to each of you for your part! She was running from place to place, as she is an avid supporter of MQG and a willing volunteer, but she had a great smile when we begged her to stop for a quick snap! Being newbies to the whole event, we decided not plan taking any classes this time (and found we would have loved it), but did sign up for some lectures. Quilt as Desired was the first one with the knowledgeable Jacquie Gerhing. The subtitle of her lecture was “how in the world do I know what I desire?” This is a very good topic for me, as I seem to want it all…or at least to try it all! Her book with a long subtitle, but lovingly known as Walk, gives great information on the quilting process with your walking foot. Her lecture was very fun and informative and she is a hoot! Oh, she is also a Kansas City girl, like me, so even better! Another good lecture was given by Latifah Saafir, titled How to Design a Quilt in 5 Easy Steps. Who doesn’t want to learn those steps? Another presenter with a congenial, jovial spirit, Latifah had some terrific points. I won’t post the pictures of her slides here…so you can go see her for yourself! The keynote speaker for this QuiltCon was Carolyn Friedlander. Young, friendly, and a creative, for sure (like everyone there), Carolyn’s topic was “You Make the Rules: How I Use Design to Guide Work and Life.” She is a tiny, little, trendy one who has had a great impact on the quilting world. Carolyn’s work was displayed in one of the exhibit halls…a beautiful room for beautiful work by many quilting artists. The center of the room featured quilted upholstery work she has done…another thing on my list, but I don’t see it in the near future! The MQG Mini-Quilt Swap was fun! I might blog in more detail about that specific event, but suffice it to say it did not dissapoint me! Thanks to my partner, Lauana, @mysewingspace on IG for a lovely mini. Lauana, you are doing fine at bridging that gap from traditional to modern quilting. @quiltydoings on the right, my swap mama and a swap fairy who came all the way from Scotland! This book will get lots of loving review and was the go-to (next to InstaGram) for relaxing moments during the show. Jacquie Gerhing signed her book Walk (and I snuck in the Modern Quilts book too) at a separate signing in the Lucky Spool booth. There was a bit of tooling around Pasadena outside the show, but not too far…we had plenty to absorb at the show! I was either too awestruck, dumbfounded, tired, or something to get more pictures! However, I was looking all over the show and late in the game finally met up with (and looked like an idiot, no doubt) with the wonderful Chawne Kimbre, aka @cauchycomplete on IG, whose work I admire. She is so sweet and soft-spoken and I would love to spend some time with her one day! As an attendee, we were asked to vote for the People’s Choice award. This is really an impossible task. It would even be difficult if you could pick one from each category! I voted for the quilt below, ‘But, I Tried To Remember’ by Heidi Parkes. It has a beautiful story and many layers process. Not the typical quilt, but very appealing. Look her up and read about it here. The People’s Choice award went to Liz Harvatine, @ladyharvatine. It actually is impressive work, but you probably can’t read the description card. So, my friends, I will post a few images of quilts, but I tell you, there is no real way to say how inspiring the work is from design to technique to finishes. I know I should post the names of each quilter… I took pictures of each sign, but they are too small to read in some cases. If you get a chance to go, you will not be disappointed in QuiltCon…maybe I will see you in Nashville next time! Since it is the first of February and the month of love, I will not beat myself up too much for the fact that every box is not checked off on my short list of January goals. That said, I will mention that I have made something for the MQG Swap…actually I have made two! I just didn’t feel warm and fuzzy about them and so I will be starting a new one today. Does that really count as a fail?? Sorry for the dark pictures! So, I moved the MQG Swap to February! February is an exciting month! My main excitement is about the 2018 QuiltCon…I am going! It is my sew mate’s, Jude Made It, birthday month and appropriate that we are going together. It is our first time to go and we are participating in as much as we can! More will come about that on the blog as it happens! In prep for the big event, there was some making in January that I didn’t blog about. Buttons and cards to swap, a lanyard for displaying the buttons, and a bag for stashing things. I am carrying the bag I made a while back as a tester for Yvonne Campbell, @quiltydream. I like that the bag and lanyard include the color of the year…Ultra Violet…or at least, some shades of it! 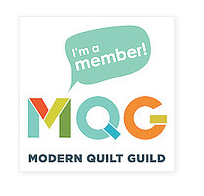 Will YOU be at QuiltCon? Once again, my February goal sheet is a little on the sparse side. This time is it because we will be traveling, in addition to QC. Though it has not been terrible winter weather here, we will be going to the Bahamas for some fun and sun and friends. I feel lucky and hope to get some great turquoise quilting inspiration! It will be great to spend time with our great friends on their boat, Terridup, too! She keeps a blog here, if you are interested in checking it out. Well, that about rounds up what I can think of today. Happy February, “make love – not war”, and happy quilting!